Even before we ask if Moray is in the Highlands of Scotland we need to ask: where exactly is Moray? First of all, it’s a chunk of Scotland that has a portion of the Moray Firth on its northern coastline. If you look at a map, the Moray Firth is the biggest bite or inlet on the east coast of Scotland. If you stand on the shore of this Moray Firth (and you’d like it if you did), anywhere between, say, Cullen and Findhorn, and look north, you’ll see a line of mountains on the horizon. Those belong to the Highlands of Scotland, of course: more accurately, the Northern Highlands. These mountains aren’t in Moray but I always think they add a particular ambience to the Moray coast. So you could say that Moray is in the Highlands, sort of - it’s certainly north of the Highland Boundary Fault, for those of you with a geological inclination. The Northern Highland hills seen from the coast of Moray in winter. These Highland hills, which coastal Moray looks out on, never appear the same twice. Some days they seem close, other days distant and half-hidden by cloud, or heat haze, or haar, or rain. Sometimes they disappear altogether. At other times you can make out individual field patterns, from about 45 miles / 70+ km away. I speak with authority here because we live by the Moray Firth shore and I can see all this from the upstairs bathroom, even in the shower (if I wasn’t so modest). So, personal reminiscences aside, that’s an important characteristic of Moray: not only does it have a fine coastline but it has this ever-changing backdrop to the north, across the waves. That in turn I think makes it one of those parts of Scotland where you can orientate yourself easily. Look, there’s north...sea, mountains...now turn round and the farming fields and woods to the south run up to higher moors, rolling hills, then eventually bigger hills - the Cairngorms - and so on out of Moray and away down through the Central Highlands and off to the main centres of population somewhere over the lumpy horizons to that other Scotland. Down there. In the south. Nothing to do with us up here. Portgordon - and very faint and distant Highland Hills that day. Moray in the Scottish Highlands. Or between them? So, that also describes the second feature of Moray - hills above, hills below. Does that help answer the question about whether or not Moray is in the Highlands? You could say it’s between them. That makes it sheltered for sure - with weather statistics such as low rainfall and high sunshine hours to back up this claim, especially in the soft coastal Laich of Moray, where ‘laich’ means low ground. To the east, are the more bare, more spare, more exposed grounds of Buchan on Scotland's north-east knuckle where the winds blow. To the west, where the Firth narrows, it’s definitely very Highland: Inverness, the Great Glen, and the wet, wet west beyond. Maybe Moray has ‘the Goldilocks Effect’. Somehow it seems just right…More prosaically, it’s probably the rain shadow effect - prevailing Atlantic rain-bearing clouds come from the south-west and dump their moisture on the high ground of the Cairngorms, on the upper part of the Spey, around Loch Ness, then finally sail over coastal communities like Findhorn or Burghead or Lossiemouth in Moray. Pretty dry by then. 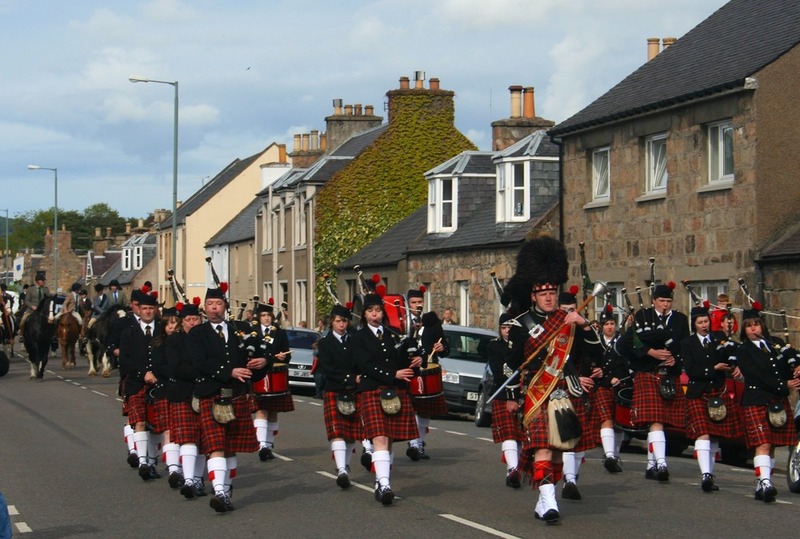 Dufftown Pipe Band march through Aberlour, Moray's shortbread capital. Gosh, doesn’t it sound ideal? Well, perhaps. But there is no escaping the shape of Scotland. There goes the main A9 road whirling the visitors up to Inverness where they fan out into the hills - basically, straight on or a bit to the left. Or they circle south again via Loch Ness on the classic ‘Milk Run’ tour of Scotland. Do many visitors get to Inverness and say ‘Well, that bit to the east looks interesting’? Truth to tell, I don’t know. OK, what would they see if they came to Moray? As if uncertain of its own offering, Moray attaches ‘Speyside’ in its tourism marketing. So they must be keen on you seeing whisky distilleries, right? After all, Speyside has plenty. Wait... what’s ‘Speyside’ anyway, you ask? That’s the valley of the River Spey that bisects the area of Moray and flows into the Moray Firth. The River Spey rises in the Highlands, so that Speyside also refers to the river when it’s in the Highlands - so probably Moray wants to be seen as Highland too. So you’d probably like ‘upcountry’ Moray and its Highland features. After all, Highlands and tartans and moody glens are what Scotland is all about, right? In fact, what a coincidence, I just found a picture of Dufftown Pipe Band doing a gig on Aberlour main street. How Highland is that? And Dufftown and Aberlour are two of Moray's most attractive wee towns. Yes, you’ll see elements of Highland scenery - moor and mountain, pinewood and rushing river, if you go visiting whisky distilleries. And you’ll probably never notice if you are in Moray or in the Highlands, unless you notice the administrative council boundary sign on the road. Now, let’s be practical here: you can visit whisky distilleries in quite a lot of other places in Scotland. It’s just that Speyside has a lot of them, so that local signposts read a bit like a well-stocked pub gantry. And, as well as distillery visiting, there are all the other stuff you can do in the Highlands - walking, climbing, mountain-biking, pony-trekking - you know the sort of thing. There’s even a long-distance walk of 65 miles / 104km, the Speyside Way, that starts/ends in Buckie, an old fishing town on the Firth, and ends/starts in Aviemore - in the Highlands (somewhat inevitably). It follows the course of the River Spey for much of the way and, can you believe it, passes along the end of our garden at one point, which I only mention for street-cred and authority, you understand, in case you didn’t believe me when I mentioned seeing orca from the bathroom. But...tell you what, let’s go back to the coast for another view of that horizon full of mountains. (You can get your Highland ambience fix that way anyway.) There is another Scotland that you can experience in Moray. Lots of wildlife-y things to see on the Moray coast. That insight into another Scotland could start in, say, Cullen. This little place gave its name to a popular fish soup. It has a sea-town, with photogenic higgledy-piggledy houses, an enticing coastal path, a slightly famous ice-cream shop, a collection of antique shops, a wacky golf course and...well, what’s not to like? And it sets up the theme for other coastal places - more colourful painted houses at Portknockie, Findochty and also the eastern outskirts of Buckie, the local centre. Cullen, the edge of the Sea-Town, Disused railway viaduct, now a walkway, and the wacky golf course. Winter light. Portknockie on the horizon. Go visit the town of Buckie. It’s the real deal. Not a tartan tatty souvenir shop in in sight, but it has - for instance - a damn fine hardware store, where they speak to you and give advice. Come to think of it, everyone speaks to you - in the baker, in the cafes, in the butcher, because it’s a real community. (Yeah, yeah, of course it’s got coffee shops...and litter issues sometimes...and the odd petrol-head on the main street. Westwards again, see the seals at Portgordon. Don’t know why they haul out just in front of that little carpark along the coast road - where there is an excellent information board - but they do. You’ll hear them sing sometimes. I certainly do as I walk past with the dog. Sometimes I think I should sing back at them. Mouth of the Spey. Osprey country. Next, sweeping west, there’s the wildness of Spey Bay where the fast flowing river reaches the sea in a confusion of shingle banks and stranded timber washed up by spate. Fishing ospreys are all but guaranteed in summer. Fishing rich people are further upstream. And then - we had to mention them - there are the dolphins. Well, sometimes there are the dolphins. Not as often as you might have been led to believe, but often enough to justify the Scottish Dolphin Centre here. And a choice of boat trips from harbours along the coast. Oh, yes, other places have tried to steal the dolphins. The city of Aberdeen does its best, but the Moray Firth bottlenose dolphins remain the biggest and blubberiest. You might even enjoy the fast jet take-offs and landings nearby. (RAF Lossiemouth is sometimes called the busiest fast-jet airfield in the UK.) Typhoon, sinister triangle in the sky, aging Tornado with that huge tailfin, and goodness knows what else. Line ‘em up with Covesea Lighthouse for a different kind of picture. Sure, there are more golf courses too. And that peerless coastline. And more little coastal towns: Hopeman with its beach-huts, Burghead with its landmark promontory (great viewpoint) that was once the capital of Pictland. And beyond, more beaches, and trails through woods that suddenly land you on a grand sweep of shoreline. Elgin Christmas Lights. Hmm. Maybe everyone went shopping in Inverness that day. All right, that’s enough. Got it? Coastal Moray doesn’t quite fit in with tartan-packaged marketing efforts, and the assumption that the Highlands are the only Scotland. Finally, if you want a classy souvenir of your visit then head for the main town, Elgin, and take a look at the decidedly upmarket Johnsons of Elgin. They are a cashmere mill with a shop, cafe and tours. Then walk round the big selection of malt whiskies at Gordon & MacPhail, also in Elgin. Right, so that’s my answer to the question about whether or not Moray is in the Highlands. Probably yes - in many ways. But most of all, the area will appeal most to slightly ‘off-the-beaten-track’ seeker who wants a different but very genuine experience of Scotland. 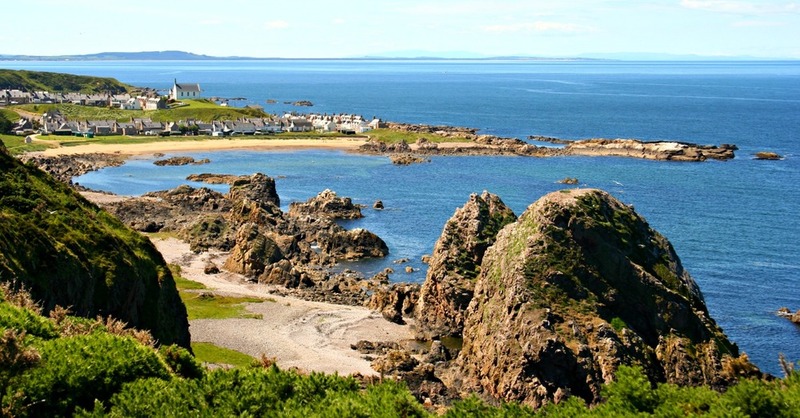 Sure, Moray is pretty and has Highland elements - and inland towns like Aberlour or Dufftown are worth a look-round: distillery options, riverside walks and so on. But the real Moray is at the coast.